Aim: This is a prospective multicenter registry designed to evaluate the incidence of adverse cardiovascular events in Middle Eastern patients undergoing percutaneous coronary interventions (PCI). The registry was also designed to determine the predictors of poor outcomes in such patients. Methods and Results: We enrolled 2426 consecutive patients who underwent PCI at 12 tertiary care centers in Jordan between January 2013 and February 2014. A case report form was used to record data prospectively at hospital admission, discharge, and 12 months of follow-up. Mean age was 56 ± 11 years, females comprised 21% of the study patients, 62% had hypertension, 53% were diabetics, and 57% were cigarette smokers. Most patients (77%) underwent PCI for acute coronary syndrome. In-hospital and 1-year mortality rates were 0.78% and 1.94%, respectively. Definite or probable stent thrombosis occurred in 9 patients (0.37%) during hospitalization and in 47 (1.94%) at 1 year. Rates of target vessel repeat PCI and coronary artery bypass graft surgery at 1 year were 3.4% and 0.6%, respectively. The multivariate analysis revealed that cardiogenic shock, congestive heart failure, ST-segment deviation, diabetes, and major bleeding were significantly associated with higher risk of 1-year mortality. Conclusions: In this first large Jordanian registry of Middle Eastern patients undergoing PCI, patients treated were relatively young age population with low in-hospital and 1-year adverse cardiovascular events. 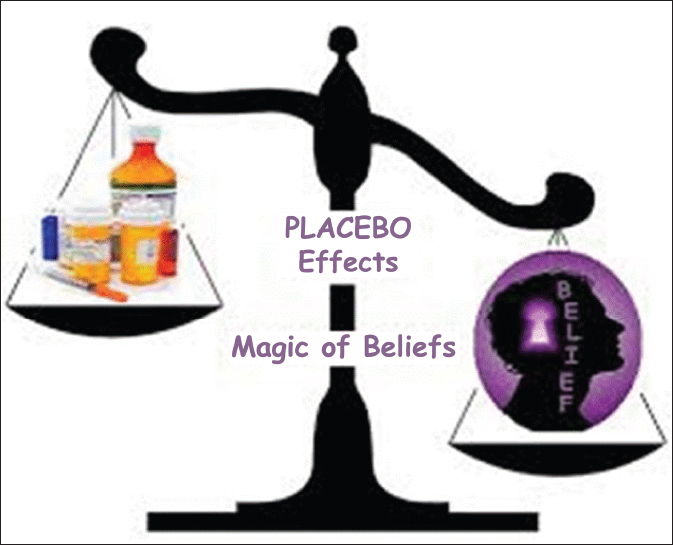 Certain clinical features were associated with worse outcomes and may warrant aggressive therapeutic strategies. Background: In response to growing concerns regarding the overuse of coronary computed tomography angiography (CCTA) in the clinical setting, multiple societies, including the American College of Cardiology Foundation, have jointly published revised criteria regarding the appropriate use of this imaging modality. However, previous research indicates significant discrepancies in the rate of adherence to these guidelines. 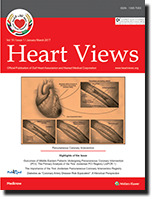 Aim: To assess the appropriateness of CCTA referrals in a tertiary cardiac center in Bahrain. Methods: This retrospective clinical audit examined the records of patients referred to CCTA between the April 1, 2015 and December 31, 2015 in Mohammed bin Khalifa Cardiac Center. Using information from medical records, each case was meticulously audited against guidelines to categorize it as appropriate, inappropriate, or uncertain. 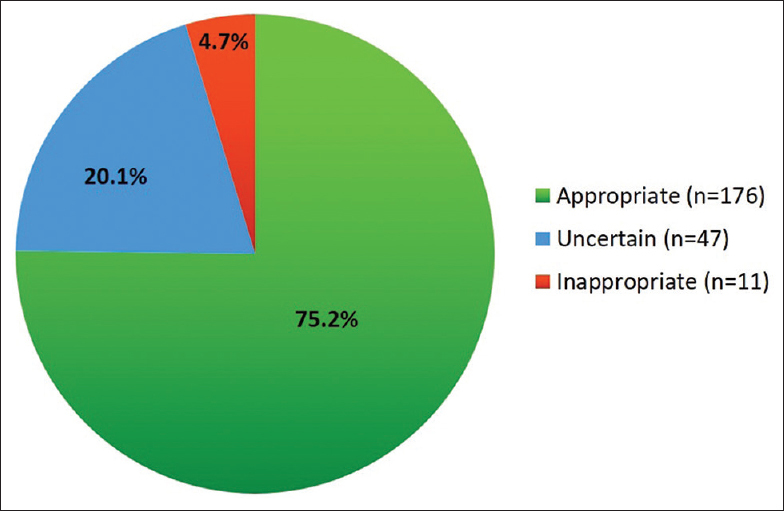 Results: Of the 234 records examined, 176 (75.2%) were appropriate, 47 (20.1%) were uncertain, and 11 (4.7%) were inappropriate. About 74.4% of all referrals were to investigate coronary artery disease (CAD). The most common indication that was deemed appropriate was the detection of CAD in the setting of suspected ischemic equivalent in patients with an intermediate pretest probability of CAD (65.9%). Most referrals deemed inappropriate were requested to detect CAD in asymptomatic patients at low or intermediate risk of CAD (63.6%). Conclusion: This audit demonstrates a relatively low rate of inappropriate CCTA referrals, indicating the appropriate and efficient use of this resource in the Mohammed bin Khalifa Cardiac Center. Agreement on and reclassification of “uncertain” cases by guideline authorities would facilitate a deeper understanding of referral appropriateness. The case of a 24-year-old male with complaints of migraine headaches was referred for echocardiography. The rest of medical history was unremarkable. Agitated saline contrast bubble study showed evidence of a right to left intracardiac shunt, probably secondary to a patent foramen ovale. 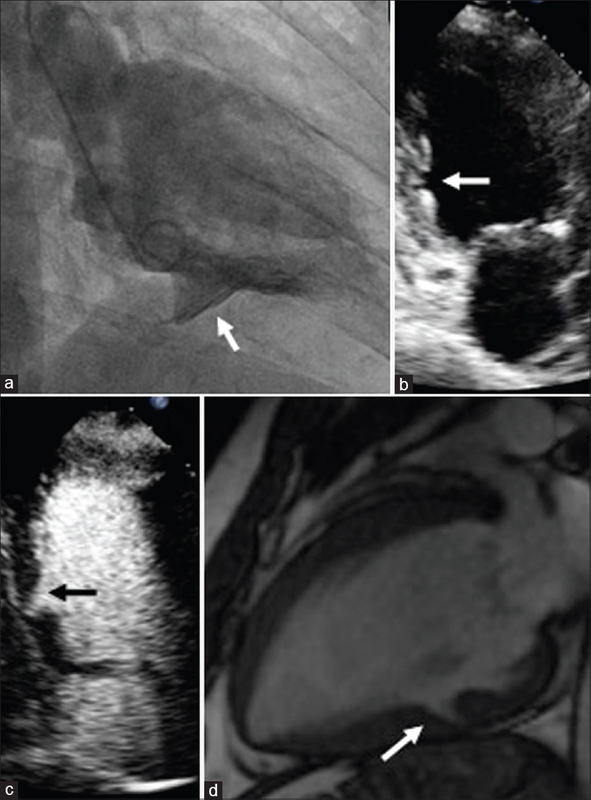 Results of a transesophageal echocardiogram suggested the possibility of an anomalous venous circulation and eventually identified as anomalous left-sided superior vena cava with cardiac magnetic resonance imaging. Myocardial clefts are rare incidental findings without clinical relevance up to now. The recognition of this imaging entity is of crucial importance to avoid misdiagnosis and even more in the context of coronary artery disease. Williams–Beuren syndrome is a multisystem genetic disorder caused by hemizygous deletion on chromosome 7q11.23, encompassing about 28 genes including the elastin gene, ELN. Cardiovascular abnormalities are frequent and are related to elastin insufficiency. 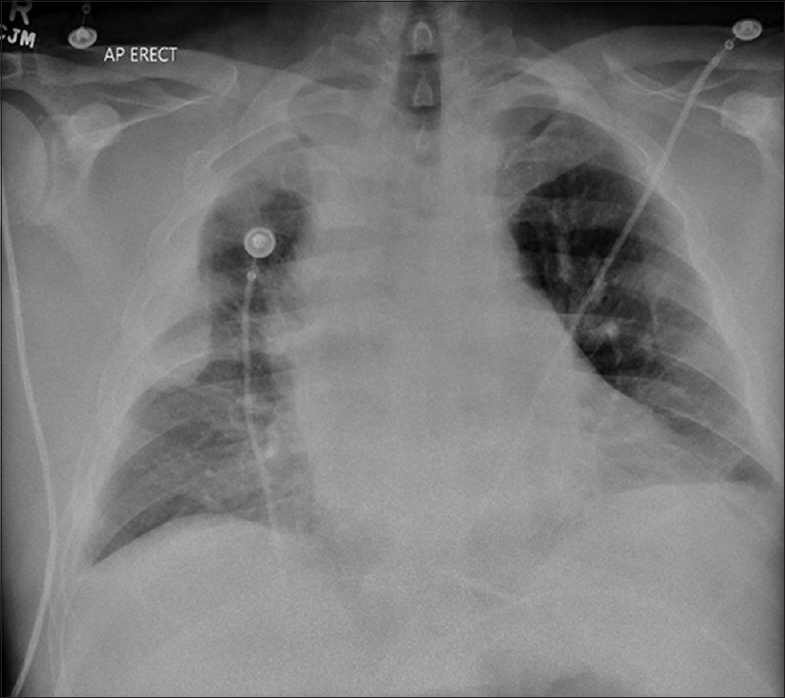 These abnormalities include supravalvular aortic stenosis (SVAS) in 70% of case, pulmonic valve stenosis, and renal artery stenosis. Definitive therapy for supravalvar aortic stenosis consists of surgical correction of the arteriopathies. Outcomes after surgical correction of SVAS depend on the extent of the arteriopathy and the presence of other associated lesions. 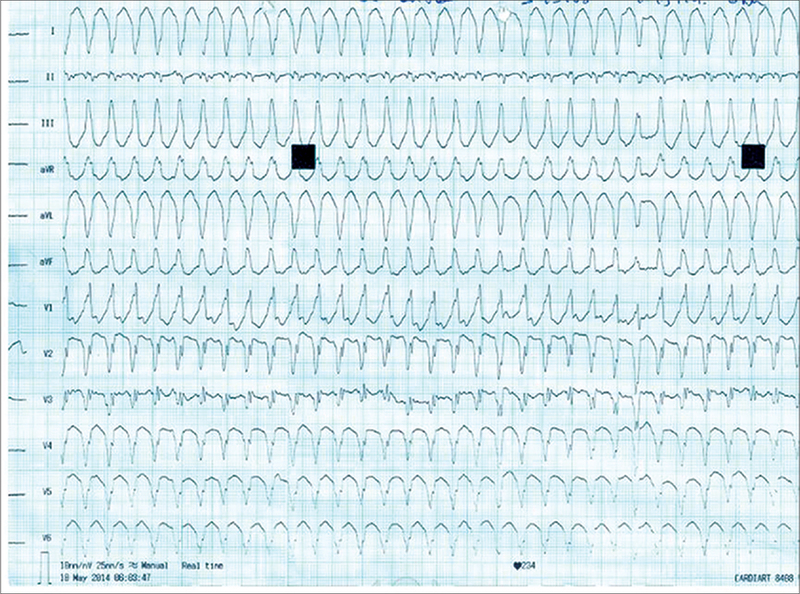 We present a case of a 4-year-old boy, with Williams - Beuren syndrome with an SVAS. The patient was assessed with computerized tomography angiography to determine the extent of the aortopathy before surgical intervention. Calcific pericarditis (CP) is a rare disease which results from long-standing pericardial inflammation. 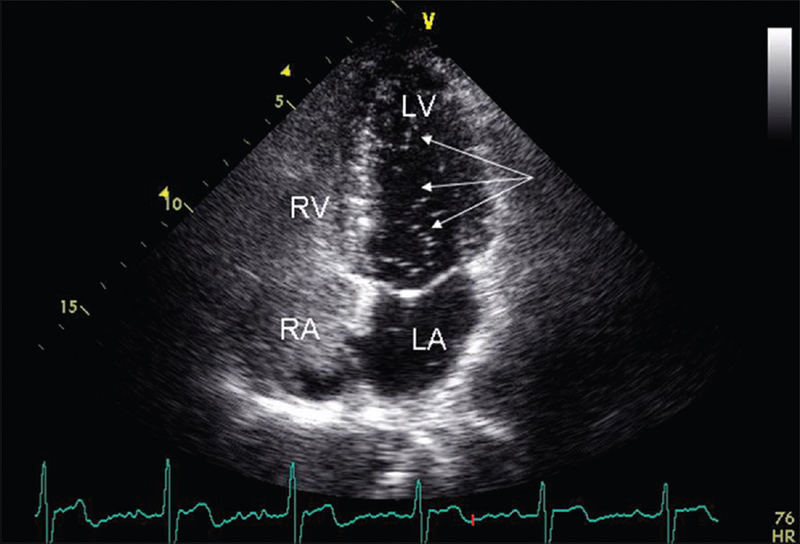 Pericardial calcification may completely or partially encase the ventricles, resulting in impaired diastolic filling. We present a case of a 53-year-old male who was incidentally found to have annular CP resulting in external compression of a large territory diagonal branch (D1) reaching the apex with likely chronically occluded left anterior descending artery with collateral circulation from the right coronary artery with hemodynamic compromise on coronary angiography. This was emergently treated with a drug-eluting stent with improved D1 flow and entailed the importance of percutaneous coronary intervention as a viable option in cases of CP resulting in acute hemodynamic compromise.